For the first time in 35 years the bull run at Madrid’s San Isidro festival has been suspended after three matadors have been seriously gored by the bulls. The organizers of the prestigious San Isidro festival said it was the first time in 35 years that the event had had to be suspended. Opponents describe the blood-soaked pageants as barbaric, while fans – including PM Mariano Rajoy – say the tradition is an ancient art form deeply rooted in national history. 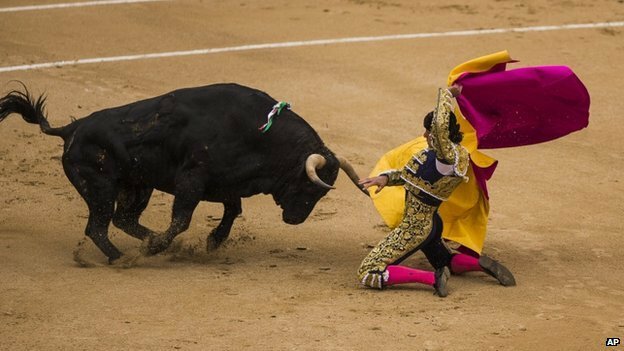 David Mora, who opened the program, fell to the ground after being knocked over by a 1,172lb bull. A shocked crowd watched in horror as he was gored and thrown through the air. David Mora sustained a large gash in his thigh and another in his armpit, bullring officials said. Spanish newspaper El Pais described the somersault as “horrific, shocking, chilling”. The second matador, Antonio Nazare, injured his knee when a bull dragged him along the sand in the bullring. And the final headlining act, Jimenez Fortes, was skewered in the right leg and the pelvis. Both men were treated for their injuries and due to be released from hospital on Wednesday. Bullfighting dates back at least 4,000 years and is thought to have been popularized by the Romans. The corrida, as it is known, is still permitted in a majority of Spanish regions despite growing criticism. Last year, Spain’s congress granted the tradition cultural heritage status in order to protect it from further bans. The move was condemned by international animal welfare groups.